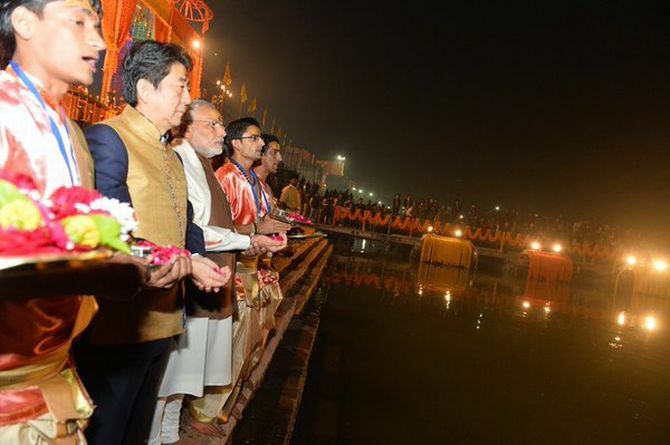 Prime Minister Narendra Modi along with his Japanese counterpart Shinzo Abe attended the spectacular sunset Ganga Aarti at the fabled Dashashwamedh Ghat in Varanasi on Saturday, marking a new chapter in traditional cultural ties between the two countries. The two leaders spent about 45 minutes at the Ghat in Modi's parliamentary constituency where they watched the Ganga Aarti, an exquisitely choreographed ritual performed daily on the banks of the river. Modi had earlier said culture and people breathe life into a relationship. "Our remarkable relationship also has a wonderful human touch. 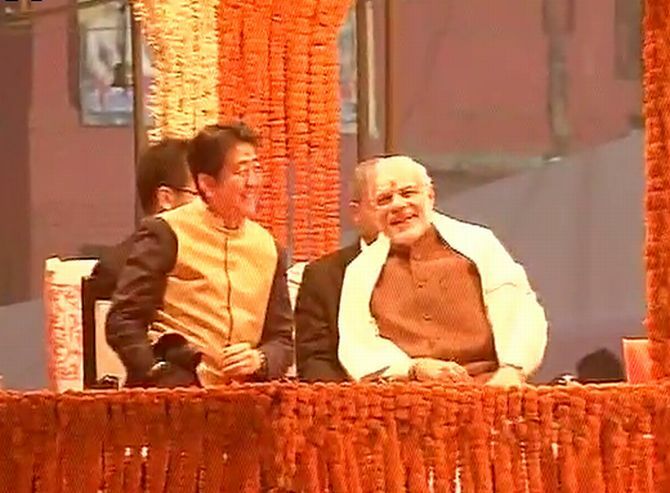 The Kyoto-Varanasi partnership is one of its strong symbols," he said at a joint media interaction with Modi. 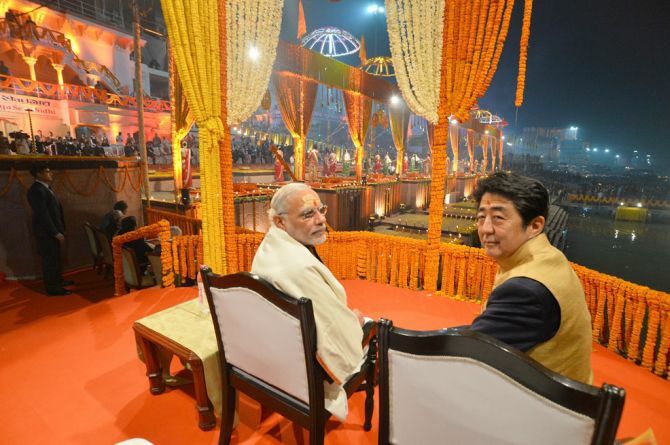 Abe's visit to the Ghat fully decorated with flowers assumed significance as it came against the backdrop of Partner City Agreement between Kyoto and Varanasi, signed by the two leaders during the prime ministers visit to Japan in August last year. 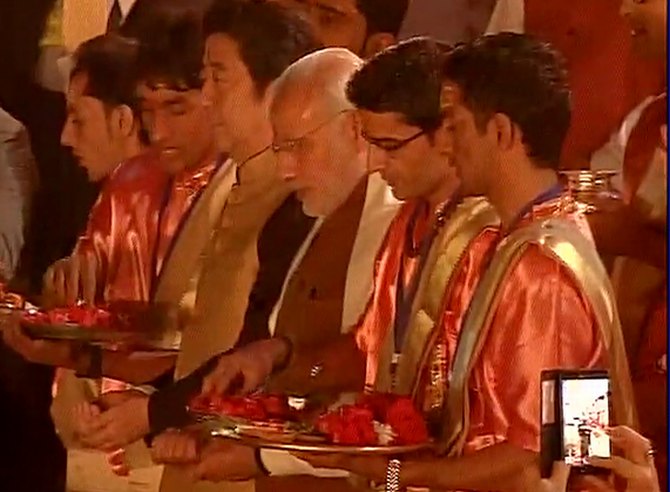 Amid chanting of slokas, Modi and Abe offered flowers and a rose garland on the banks of the river. Nearly 7,000 security personnel were pressed into service for the high-profile visit lasting about four hours. Security at the normally crowded Ghat has been taken over by the Army and the Navy while scuba divers of the National Disaster Response Force were deployed around the make-shift stage which has been erected with the help of pontoons on the river bed. Personnel of the elite Special Protection Group (SPG) have been camping in the city since Tuesday. They are being assisted by the National Security Guard, Anti-Terrorist Squad, Central Para Military Forces and the state police. The entire 22-km-long route, from Babatpur airport to the Dashashwamedh Ghat, is dotted with posters, banners and banners of various designs, welcoming the two prime ministers. Some of these also carry messages in the Japanese script. Roads have been freshly macadamized while traffic restrictions have been in place since last night itself. Both the prime ministers arrived at the ghat at around 6.30 pm where they were greeted with chants of ‘Har Har Mahadev’ -- an invocation of Lord Shiva and a traditional form of greeting people in this ancient temple town. 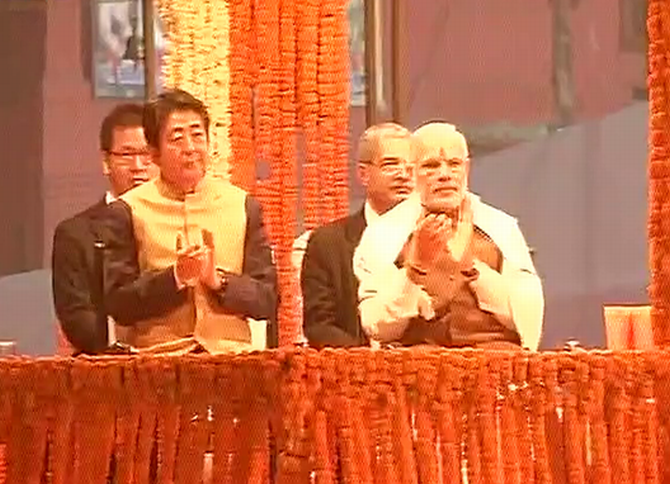 Modi stood on the steps of the ghat for a few seconds and waved at the crowd who were chanting "Modi Modi". Thereafter, the two leaders descended to the last step of the ghat and stood there for around 10 minutes for performing the rituals of 'abhishek' of the Ganga and Bhagirath, the king in Indian mythology credited with bringing the river to earth. 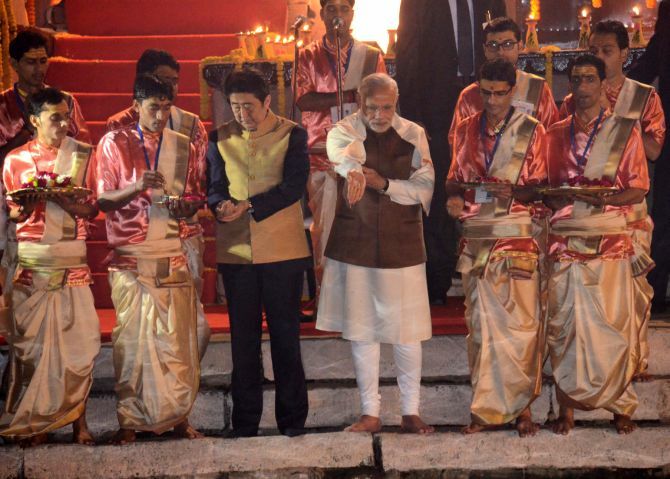 Modi and Abe then took their seats at a raised platform covered with decorated marquees to get a vantage view of the Ganga Aarti which was performed by nine priests and 18 girls symbolising "riddhis and shiddhis" (divine bounties). During the Ganga Aarti, Abe took out his camera and clicked photographs of the ceremony. As the chanting of devotional songs reached a crescendo, both the prime ministers stood up and remained standing till the ceremony came to a close. Thereafter, they once again waved at the crowd. Before their departure, both the prime ministers were presented with an identical set of mementos by the organisers of the aarti.